Western New Mexico. San Juan County. Closet City or Town: Aztec; Farmington; Bloomfield. Area: 318 acres (1.2 km²). Halfway point between Chaco Canyon (65 miles/104 km) headed south and Mesa Verde (40 miles/64 km) to the northwest. 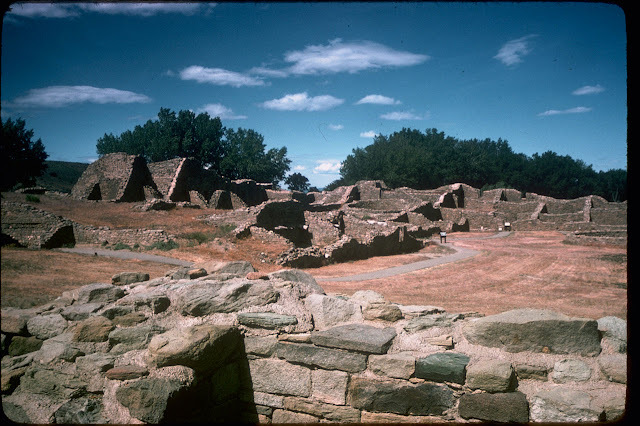 After Chaco, this archaeological site was the second largest settlement of the Ancestral Puebloans and the most concentration population and architecture. Designed and built not too long after the nearby Salmon site. Represents the next architectural floor plan in an intended series of future settlements (of a similar model). An important Chacoan outlier and an outstanding walled village. The Great House constructed here mirrors so-called downtown Chaco. 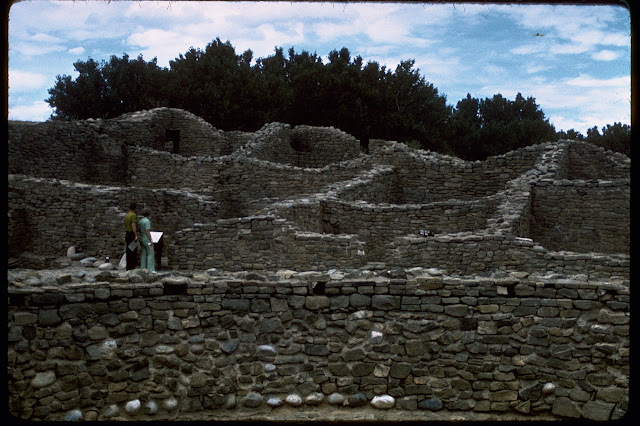 The Aztec site was designed to match Chaco’s exact square footage. 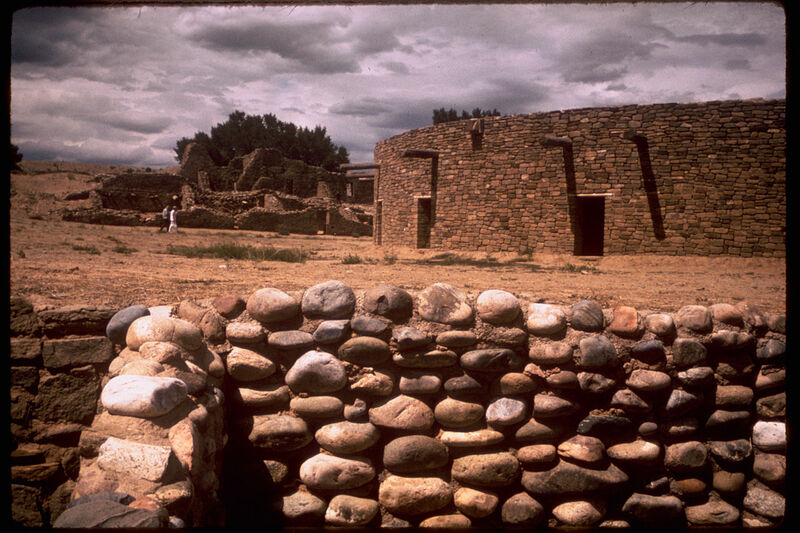 Dwellings are all angled toward and away from another, just like Chaco’s Great Houses. All were elevated around one another in a similar manner and distances between the more prominent kivas are nearly the same. Directions of lines formed by various walls of dwellings are repeated to within a small degree of accuracy. The West Ruin is the same dimension of Chaco’s Pueblo Bonito. Over four hundred different designs of pottery vessels were discovered here. The site may have functioned as a trade center. Dwellers related to the Mesa Verde people. One of the largest pueblo villages in the Southwest. Defensive structures indicate a potential threat from outsiders. Focus: human history, archaeological ruins, and pottery. 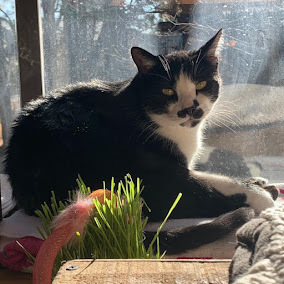 Like Montezuma Castle in central Arizona’s Verde Valley region, Aztec ruins were mistakenly thought by mid-19th-century Anglo explorers to be built by the Aztec Emperor, Montezuma II (often spelled Moctezuma). However, these ruins precede his Mexican empire dating from around the 12th-century (or even much earlier). First arrivals of Ancestral Puebloans between 1088-1091 and constructed around 1100 by people indigenous to this region. It is thought by some cultural scientists they were related to the Mesa Verdans in southwest Colorado. Both cultures had close ties to the Chaco culture. Other clans also related to the Mesa Verdans eventually took over the Aztec site but only after it was abandoned by the original builders around 1226. Aztec preserves structures of notable architecture and was inhabited for about two hundred years. The deepest excavations have uncovered Chacoan pottery. Major innovative changes in the architecture were made soon after the new tenants arrived. New floor plan called for mainly dividing spacious rooms and building numerous small kivas within the large square and rectangular rooms. As each succeeding group moved in, the inhabitants depleted the resources of the area according to their preference. Eventually, each group moved on. According to tree-ring dating, the West Ruin was built between 1111 and 1115. 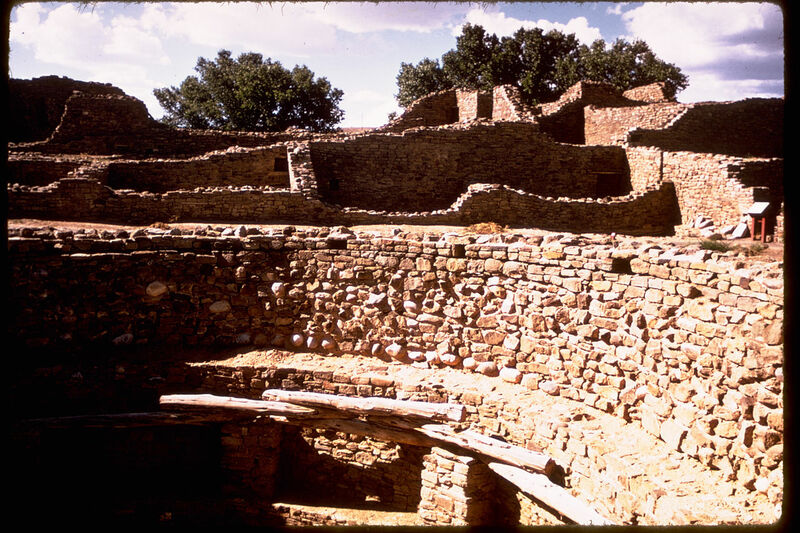 This pueblo with four hundred and fifty rooms on three levels features over a dozen ceremonial chambers, including one of the few tri-wall kivas ever discovered. By the 13th-century, Aztec may have equaled Chaco in size and most likely held similar religious and ceremonial significance. What remains today is the ruins of a walled village of exceptional design. Aztec Ruins was declared a national monument in 1923. 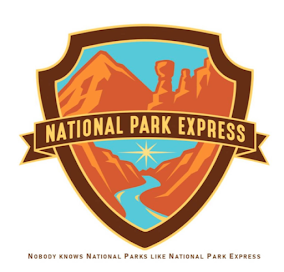 Governing body: NPS and part of Chaco Canyon National Historical Park. Likely, Aztec typifies a new locus of power. With a reliable year-round water resource and a favorable climate, these factors were likely a determining factor for a near duplicate Chaco compound in this locale. It was also built and reborn; that is in the semblance of a continuing empire during a time of prevailing drought. Built on a broad terrace overlooking the Animas River, Aztec was one of the largest and best-constructed settlements of the Ancestral Puebloans in the Southwest. The entire region was saturated with their culture, representing many distinct tribal bands of satellite communities throughout the Four Corners region. It’s believed these individual sects formed a greater community and were informed of the important news by long distance runners or signal fires alerting distant neighbors to threats of invasion. The ruins are divided into east and west sectors; however, only parts of the western sector are open to the public. Although occupied at different times, the exact nature and extent of the interaction of these prehistoric occupants mixing with their regional neighbors are not known. For construction, a core-and-veneer style was used, applying a thick rubble core and laid within a finely shaped stone veneer. Aztec's multistoried village uniquely faces inward, enclosing an open plaza dominated by a Great Kiva nearly 50 feet (15 m) across. Four massive tree columns supported a roof estimated to have weighed 95 tons (86 metric tons). A stack of four stone disks, with an estimated weight of 375 pounds (170 kg), supported each column. Like Chaco and nearby Salmon ruins, timber used for supports were carried on the shoulders of laborers and transported from distant mountains of western New Mexico or southern Colorado. Additionally, fifteen surface rooms encircled the sunken chamber, each with an outer doorway that opened onto a spacious plaza. What may have been something akin to an altar stood in the north alcove. A masonry bench circled the kiva floor and was exclusively used by adult males from the community. Each entered the dimly lit ceremonial room by stairways on the north and south. The monumental scale and ritual design of this particular Great Kiva reflected its noteworthy importance to the inhabitants and talented builders. At its peak, it is estimated several hundred people may have lived in this village. Aztec was also one of the greatest architectural designs ever built by the Ancestral Puebloans. Bonus Details: Hundreds of rooms in the village formed massive walls set at right angles around the central plaza. A low row of single-story rooms on the south completed the enclosure. Rooftops once stepped upward in three sun-facing tiers, reaching nearly 30 feet (9 m) on the north wall. The village’s elaborate design was apparently well thought out before construction. Aztec pueblo, among similar others, was built in an ideal location (close to year-round water). If invaded, the relatively few entryways leading into its compound could easily be defended. Some rooms within its domicile were also entered through a hatchway in the ceiling while others had doorways covered by matting skins or textiles. These entries led into large rooms with lofty ceilings. 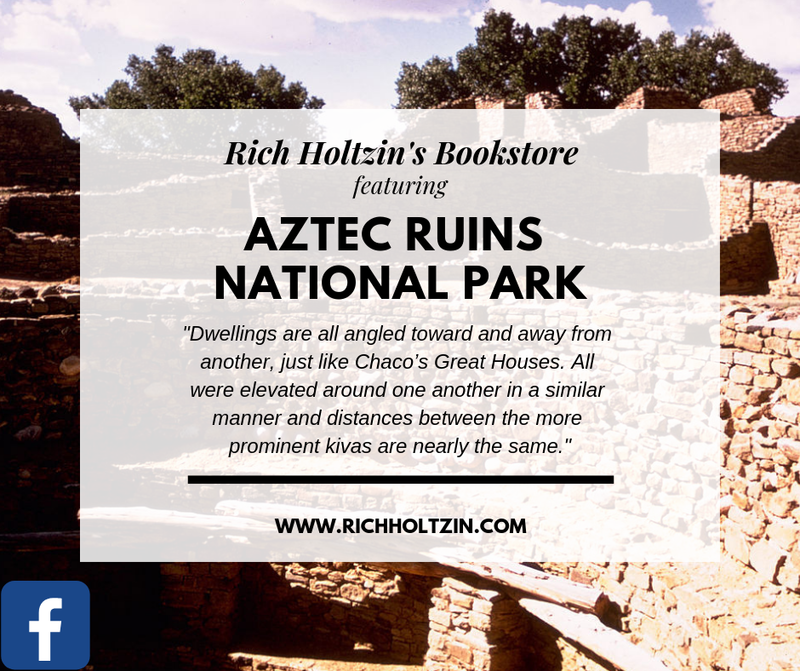 Because Chaco is considered the center of the Ancestral Puebloan culture, Aztec, and Salmon ruins are called outliers of Chaco’s momentous spiritual center. Take Ruins Road about .5 mile (.8 km) north of Hwy. 516 in the City of Aztec, New Mexico; from Albuquerque/Bloomfield: follow Hwy. 550 north to the City of Aztec, turn left at the "T" intersection onto Hwy. 516 for .3 mile (1.2 km), then turn right after crossing the river onto Ruins Road.